Update: DEGIRO stopped offering the American ETFs. This guide is still working to buy any other ETF. If you want to buy VT, you will have to use another broker such as Interactive Brokers. 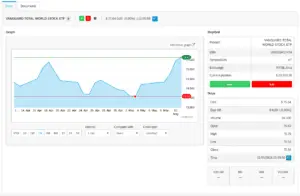 In this post, we are going to see how to buy an Exchange Traded Fund (ETF) on DEGIRO. 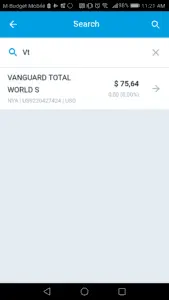 Vanguard Total World (VT) is the main part of my new portfolio. So I am going to use VT as an example. The process is exactly the same with any ETF you buy. I decided to use DEGIRO after comparing with several other brokers. The main advantage of DEGIRO is its very low fees. You can read my full review of DEGIRO if you want more information. This post assumes you already have an account with DEGIRO. If not, you can open one account very quickly. Note: Links to DEGIRO are affiliate links. If you use them to create an account, you will receive 20 CHF and I will receive 20 CHF. In this post, I am going to assume that you already have enough money on your account to buy at least one share of VT. I am also going to assume that you are using CHF as your base currency. If you are not using CHF, this will not change anything since currency conversions are automatic. 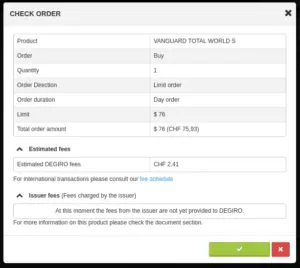 As you will see, it is easy to buy something with DEGIRO. There are two main portals: The web interface and the mobile application. I am going to cover both. Let’s start with the web interface. The first thing you need to do is to log in to your account. Then, you have to find the ETF. There are several ways to do that. If you never bought it, you can search for it in the search box. You can use the ticker (VT) or the name to search for it. Then, you can click on the name to go to the ETF page. If you already have this ETF, you can go to your portfolio page and click on the ETF name. On this page, you have all the current information about the ETF. On the left, you get the graph of the VT price. And on the right, you get the current price information. You can also see your current position in the ETF. On this view, the market is not open. So the last information about volume, bid and ask is empty. This is not a problem, you can, of course, place an order out of trading hours. The order will be executed as soon as possible. You probably noticed the big Buy and Sell buttons. Just press the Buy button to buy new shares. Again, on the right, you get all the current information about your position and the price. On the left, is the configuration of your order. 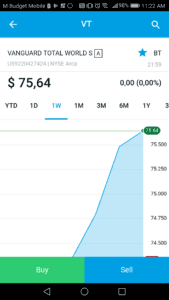 Here, I have specified that I wanted to buy one share at a maximum of 76 USD. Be aware that it will not let you trade if you do not have enough cash. Be careful to have some extra cash when trading in foreign currency. If the exchange rate changes enough you may end up with not enough currency for the trade! Limit Order. You set a maximum to buy a share or a minimum to sell a share. The order will only be executed if your maximum or minimum is met. This is the default option. Market Order. The order will be executed at the current best possible price. You should be careful with this order type. Especially with less liquid products. Stop Loss Order. As soon as the share reaches the loss price, a market order is filled in the market. The sell order is then executed at the best possible price. In some cases, it could be sold well below the loss price. Stop Limit Order. As soon as the share reaches the loss price, a limit order is filled in the market. This gives you a better control than a stop-loss order. But if the market goes too quickly below your limit order, you may not be able to sell. I recommend you to use limit orders in general. You will avoid surprises. Do not try to time the market by using “smart” limit. 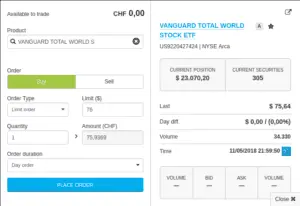 If you trade only with high-volume ETF, you can also use a market order. It should not make a big difference. Day order. The order will be valid until executed or until the end of the day or until the market closes. GTC (Good Till Cancel) Order. The order will be valid as long as possible. This depends on the market. European markets allow orders lasting up to one year and US market allow orders for up to 90 days. 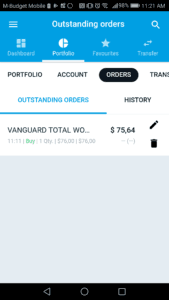 For simple passive investors like us, day orders are more than enough as a tool. For instance, I invest once a month regardless of the market. Ok, let’s go back to the matter at hand. 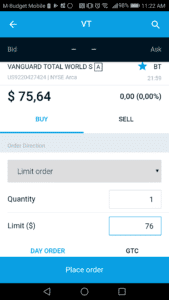 I am using a Limit order only valid one day. Let’s confirm the order with Place Order. You can still cancel the order. You can also edit the limit for instance. Now, you just have to wait until the order is executed. Once possible, DEGIRO will execute the order. At that point, you cannot cancel anymore. You will have one more share of the VT ETF. You can take a look at your portfolio to see the new total. Everything that was done on the web application can also be done on the mobile application. Let’s see again the same process on your phone (or tablet). From there, you can buy and Sell with the very big buttons at the bottom of the view. 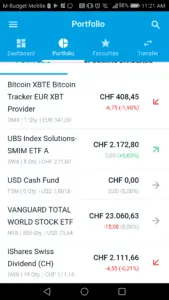 To buy the ETF, press the Buy button. Here you can configure your order. 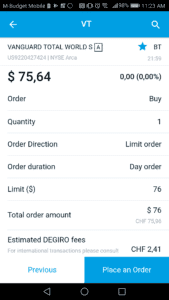 I simply set a limit order for one share at a maximum price of 76 USD. I explain the different types of order in the previous section. Once your order is ready, you can press “Place an Order” to get the final confirmation view. Review carefully all the data and then press Place an order to confirm your order. Once you confirm it, the order will be in the Orders view until the market executes it. You can still cancel it from this view as long as it is not executed. Once it is possible, DEGIRO will execute your order on the market. After this, you will not be able to cancel the order anymore. If you go to your portfolio view, you should have more shares of the VT ETF. As you saw, buying (and selling) ETFs on DEGIRO is pretty straightforward. There are several options that are a bit more complicated. But simple investors only need the default options. This makes it very easy. And since you should not be day trading, repeating this process a few times each month should be easy! If you need more information on DEGIRO, read my review of DEGIRO. 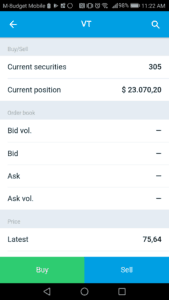 Do you have more questions on how to buy ETFs on DEGIRO? Or more questions on DEGIRO? Very good article. I thank you for all this valuable information. However, I have some questions about taxes. How do I proceed with my Swiss tax return? Could you do an article about that? Thanks, looking forward to keep reading your blog. You mean how to fill your tax declaration ? You need to declare every single fund you got as an asset in your tax declaration. You also need to declare the dividends you’ve got. For this, it will depend on which ETF you have. If you have the VT ETF as in my example, the dividend will be withheld by the US. You can reclaim these with a DA1- form. Personally, I never reclaimed the dividends so far. I plan to study this in depth and post about this, but this may not be for some time. Thank you for your answer. I’ll read this quietly. I haven’t tried with an ETF yet on Degiro but I read on the MP forum that with the new regulations Swiss/European residents cannot by ETF listed on American exchanges since Jan 18. Have you had any problems (It doesn’t seem like it based on the post) but have you heard about this as well? It is not that they are blocked, but they need some special documentation before they can be available to EU. This is due to new regulations. However, I haven’t had any issue with any of the ETF I’m using. VT is still available for instance. If you only use VT, they should not be any issue. But I don’t know if all ETFs are available now. Nice to hear that! I plan to make my 1st transfer to Degiro later today. Yesterday, I did my first buy on Degiro. The UI is a bit different from the one you have here, but it was easy to buy some shares. The transfer from my bank to Degiro, took 2 days as expected. Did you do the trade on the web application ? Did it really change so much ? Care to share what you bought ? No, minor UI changes (web application) but easy to buy with the steps you described. Only VT. My plan will be similar to yours probably, 80% VT and 20% Swiss. I didn’t even realize there were changes. I’ve just opened an account using your link (I hope it worked). Can you tell me if Degiro allows to buy fractional ETFs? Also, be aware that DEGIRO does not offer the VT ETF anymore. Previous Previous post: My 9 biggest investing mistakes – How to avoid them!